Denver, Colo., Apr 22, 2019 / 03:00 am (CNA).- Jenna Guizar grew up without any sisters. But these days, Guizar relishes having a "sisterhood" of digital and physical communities of Catholic women around the world. Guizar presides over a growing international women’s ministry, Blessed is She, which will mark its fifth year in September. The ministry began as a web-based devotional for Catholic women based on the day’s Mass readings. “I loved what some of the Protestant women’s ministries were doing with Scripture study, inviting women to spend time daily in the Word. I wanted that for Catholic women, too,” Guizar, 35 and the mother of four daughters, explained. Now Guizar, along with a small staff and a national team of writers, whose contributions are vetted by theological editors, is feeding more than 60,000 women around the world with a daily email that delivers reflections on the Mass readings, along with a link to the readings themselves on the USCCB website. On social media, tens of thousands follow along in regional Facebook groups, forming virtual communities that have morphed into hundreds of physical communities around the world. On Blessed is She’s Instagram account, which has more than 100,000 followers, retreat director Beth Davis hosts a popular segment called ‘Teachable Tuesday,’ where she gives instruction different Catholic methods of prayer, wisdom from the lives of the saints, and deeper dives into Scripture. Participants pop on at the beginning of the segment and announce their geographical locations: Ireland, Australia, Tanzania, Mexico, and the United States. “Basically my whole adult life has been spent working for the Church,” says Davis, “but I’ve never experienced what we experience with these women every day, on retreats, on Instagram, in regional groups. “What makes Blessed is She different is that it’s not about one person, there is no cult of personality. It’s all focused on Christ.” Davis explained, and Guizar agreed, when asked what she thought was driving the ministry’s growth. “We’re just here walking alongside the women we serve, as women who are experiencing deeper conversion in their own lives,” added Guizar, explaining that she doesn’t see herself as doing anything extraordinary, apart from being available and willing to answer a need to which she herself felt drawn. “My own personal, daily conversions happen in large part because of Blessed is She. I feel a great responsibility and honor to be given this ministry by the Lord. I feel a great responsibility to draw closer and closer to Him so that I can be the leader and woman He wants me to be,” Guizar said. Both Guizar and Davis said that working for the ministry has deepened their spiritual lives. “I needed this community for my own conversion” Guizar said. She recalls feeling a growing sense of isolation as a young mother, struggling to find her place in the Church. That was back in the fall of 2014. The first Blessed is She devotion went out on September 1, 2014. By the end of the year, more than 200 women had signed up to receive the emails. By 2015, that number had increased to more than 2,000 women. And by early 2019, that number had risen to more than 60,000. 50% of Blessed is She participants are millennials - or younger - falling between the ages of 18 and 35. Women between 36 and 65 make up another 35% of the demographic. Blessed is She brunches and retreats now make up a significant portion of the ministry’s focus, with more than 400 member-hosted brunches logged in 2018. So far in 2019, more than 500 women have attended a Blessed is She retreat somewhere in the US or abroad. Still to come this calendar year: retreats in Nashville, Texas, and Ireland. If you ask for stories of how Blessed is She is impacting women’s lives, the answers come back to a common theme: community. “Faithful Catholic women who are lacking community in real life and who’ve felt like they’re the only Catholic left on the planet” are finding out they’re not alone, and being encouraged by other women who are following Christ. O’Leary said, “One older woman had prayed specifically for a young mom who was moving to her city to find the perfect house. When those two met at my Blessed Conversations group, they embraced like old friends. The bonds of sisterhood transcended age, location, and even the internet." Guizar touched on the theme of community repeatedly in an interview with CNA, emphasizing its significance to the heart of the ministry. Guizar says she doesn’t have a plan for Blessed is She, but is just trying to be faithful. Editor's note: In addition to her work at CNA, Jenny Uebbing is a periodic freelance contributor to Blessed is She. Shrewsbury, England, Apr 21, 2019 / 03:01 pm (CNA).- Easter is not a time for political debate, but is rather an opportunity to encounter the pinnacle of the faith – Christ’s death and resurrection, Bishop Mark Davies of Shrewsbury said in his homily for the feast. At the April 21 Mass said at Shrewsbury Cathedral, Bishop Davies referred to increasing political bitterness and an indifference to Easter's significance. “Everything rests on the witness given by those who, on that first Easter morning, came to ‘see and believe'; on the witness of the Apostles and their Successors who stand with Peter in testimony that ‘God raised Jesus to life',” he said. Easter is a celebration of the Christian foundation, he said, but it is not an excuse for clergyman to criticize on passing political opinions nor is it a time when political sentiments should be prioritized. “All of our Christian faith and the whole of Christian civilisation depends on this Day,” he said. “[Political] choices ought not to concern us on this greatest day in the Christian Calendar,” he further added. This Easter has come at a time of much political strife, he said, noting that English society has seen a deterioration in people’s civility toward those who hold opposing beliefs. As tolerance has declined so has the culture’s comprehension of Easter and truth, he said. “May the light of this Easter Day lead us gently as a nation to ‘see and believe’ God’s great purpose for us, and so to recognise anew the truth by which we and all of human society can be saved,” he said. Colombo, Sri Lanka, Apr 21, 2019 / 12:40 pm (CNA).- Religious and civil leaders have responded with condolences, prayer, and calls for justice after several explosions at churches and hotels in Sri Lanka killed more than 200 people and injured hundreds more on Easter Sunday. Calling it “a very, very sad day for all of us,” Cardinal Malcolm Ranjith, Archbishop of Colombo, canceled all remaining Easter Masses for the day in the Colombo district. He expressed his “deepest sorrow and sympathy to all those innocent families that have lost someone, and also to those who have been injured and rendered destitute,” Vatican News reported. “I condemn – to the utmost of my capacity – this act that has caused so much death and suffering to the people,” Ranjith said. He called for a strong and impartial inquiry to find those responsible for the attacks. At the conclusion of his Urbi et Orbi address on Easter Monday, Pope Francis said the violence in Sri Lanka has brought “grief and sorrow” to the people there. “I wish to express my affectionate closeness to the Christian community, struck while it was gathered in prayer, and to all the victims of such cruel violence,” he said. “I entrust to the Lord all those who have tragically perished,” he said, adding his prayers for those who are injured and suffering from the attacks. Shortly before 9 a.m., explosions were detonated during Easter Mass at Catholic churches in the Sri Lankan capital, Colombo, and in Negombo, a city 20 miles to its north. At the same time, a bomb exploded at a service at the evangelical Zion Church in Batticaolo, on Sri Lanka’s east coast. Pews were shattered by the blast at St. Anthony’s Shrine in Colombo, and floors and ceilings were covered in blood. The Catholic shrine is the most well-known church in Sri Lanka, and is designated the country’s national shrine. 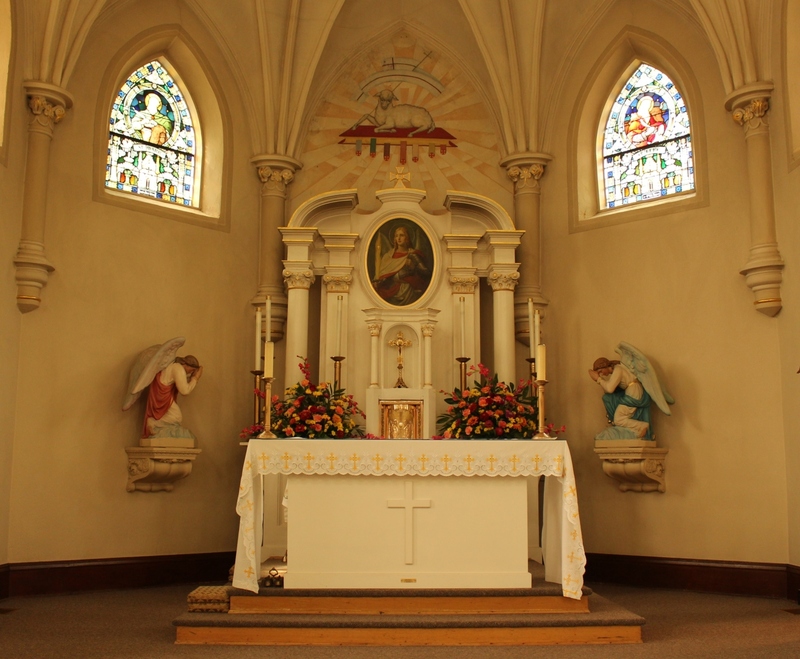 The first chapel on the Church property was built during Sri Lanka’s Dutch colonial period, when Catholicism was mostly forbidden on the island. There were also explosions Sunday morning at three luxury hotels in Colombo, and explosions outside a zoo and a private home Sunday afternoon. A spokesperson for UN Secretary General António Guterres voiced outrage at the attacks and calls for justice for perpetrators. No group has claimed responsibility for the attacks, but a police spokesman said seven people have been arrested in connection with them, according to the AP. Some reports suggested that an additional six suspects were later arrested. The island nation, which is home to a population of more than 21 million, has been plagued with periodic violence since its 26-year civil war concluded in 2009. More than 70% of Sri Lankans are Buddhists, roughly 13% are Hindus, almost 10% are Muslims, and fewer than 8% are Christians. There are 1.5 million Catholics in the country, constituting the overwhelming majority of the Sri Lanka’s Christians. Vatican City, Apr 21, 2019 / 04:56 am (CNA).- Christ’s resurrection ushers in a new world – one of peace, love, and fraternity, Pope Francis said on Easter Sunday, as he prayed for the many people who are suffering throughout the world. Pope Francis gave the traditional Urbi et Orbi blessing from the central loggia of St. Peter’s Basilica following Easter Sunday Mass in St. Peter’s Square. He forwent giving a homily at Mass this year, and instead paused for a moment of silent reflection following the Gospel. “Urbi et Orbi” means “To the City [of Rome] and to the World” and is a special apostolic blessing given by the pope every year on Easter Sunday, Christmas, and other special occasions. Francis prayed for the many people throughout the world living in places experiencing conflict, tension, and violence. Beginning with Syria, he said there is a risk of becoming resigned and indifferent to the ongoing conflict in that country and emphasized that now is the time for a renewed commitment to a political solution for the humanitarian crisis in the country. People there are hoping for “freedom, peace and justice,” he said, urging solutions for a safe re-entry to the country for those who have been displaced, especially in Lebanon and Jordan. “May the light of Easter illumine all government leaders and peoples in the Middle East, beginning with Israelis and Palestinians, and spur them to alleviate such great suffering and to pursue a future of peace and stability,” he stated. He begged for an end to conflict and bloodshed in Libya, and for peace on the entire African conflict, particularly in the countries of Burkina Faso, Mali, Niger, Nigeria, Cameroon, Sudan, and South Sudan. Recalling the spiritual retreat held at the Vatican earlier this month for several religious and political leaders of South Sudan, he prayed for the opening of “a new page” in the history of the country. Francis prayed for the peace of Easter to bring comfort to the people of the eastern regions of Ukraine. For the American continent, he invoked the joy of the resurrection for all those experiencing difficult political and economic situations. Let there be an end to the arms race and to the “troubling spread of weaponry,” he added. “Before the many sufferings of our time, may the Lord of life not find us cold and indifferent. May he make us builders of bridges, not walls,” Francis stated. “Today the Church renews the proclamation made by the first disciples: ‘Jesus is risen!’ And from mouth to mouth, from heart to heart, there resounds a call to praise: ‘Alleluia, Alleluia!’” he rejoiced. At the end of the blessing, Pope Francis expressed his sorrow for several bombings which took place in churches and hotels in Sri Lanka Sunday morning. More than 100 people were killed and hundreds injured in explosions at three luxury hotels and three churches. St. Anthony’s Shrine in Colombo and St. Sebastian’s Catholic parish in Negombo were targeted, as well as the evangelical Zion Church in Batticaolo. Francis entrusted to the Lord those who have died and been wounded, and all who are suffering because of the attack: “I wish to express my affectionate closeness to the Christian community, struck while it was gathered in prayer, and to all the victims of such cruel violence,” he said. The pope wished all those gathered in St. Peter’s Square, and all those participating via radio or television, a happy Easter, noting that it was on Easter Sunday 70 years ago that a pope spoke for the first time on television. Venerable Pope Pius XII addressed the viewers of French TV, “underlining how the eyes of the Successor of Peter and the faithful could also meet through a new means of communication,” he said. Francis also thanked the donors of the flowers in St. Peter’s Basilica and Square, which came from the Netherlands and Slovenia. “Enlightened by the light of Easter, we carry the scent of the Risen Christ into the solitude, into the misery, into the suffering of so many of our brothers, reversing the stone of indifference,” he concluded. A plenary indulgence, or the remittance of temporal punishment due to sins which have already been forgiven, is granted to those who participate in the Urbi et Orbi blessing in person or through radio, television, or the internet. The usual conditions for a plenary indulgence must be met: the individual must be in the state of grace and have complete detachment from sin. The person must also pray for the pope's intentions and sacramentally confess their sins and receive Communion up to about twenty days before or after the indulgenced act. At 8:45 a.m., explosions were detonated during Easter Mass at churches in the Sri Lankan capital, Colombo, and in Negombo, a city 20 miles to its north. At the same time, a bomb exploded at a service at the evangelical Zion Church in Batticaolo, on Sri Lanka’s east coast. St. Anthony’s Shrine was the Catholic church targeted in Colombo, and St. Sebastian’s is the Catholic parish in Negombo. Pews were shattered by the blast at St. Anthony’s Shrine in Colombo, and floors and ceilings were covered in blood. The shrine is the most well-known Church in Sri Lanka, and is designated the country’s national shrine. The first chapel on the Church property was built during Sri Lanka’s Dutch colonial period, when Catholicism was mostly forbidden on the island. In recent weeks, there has been concern that Sri Lankans who had been part of the Islamic State could become a threat, as they have begun returning to the country from the Middle East, according to the BBC. The country has been plagued with periodic violence since its 26-year civil war concluded in 2009. Sri Lanka is an island nation in the Indian Ocean, southwest of the Bay of Bengal; its population is more than 21 million. More than 70% of Sri Lankans are Buddhists, roughly 13% are Hindus, almost 10% are Muslims, and fewer than 8% are Christians. There are 1.5 million Catholics in the country, constituting the overwhelming majority of the Sri Lanka’s Christians. In a January 2015 visit to the country, Pope Francis urged peace and reconciliation among the country's rival factions. “In this difficult effort to forgive and find peace, Mary is always here to encourage us, to guide us, to lead us,” the pope said Jan. 14, 2015, at the Our Lady of Madhu shrine in Sri Lanka's Mannar district. This story is developing and will continue to be updated. Vatican City, Apr 20, 2019 / 02:16 pm (CNA).- In his Easter Vigil homily, Pope Francis said that the Risen Christ desires to “roll back the stone” that blocks the entrance to one’s heart, so that God’s light and love can enter. “The Lord calls us to get up, to rise at his word, to look up and to realize that we were made for heaven, not for earth, for the heights of life and not for the depths of death,” Pope Francis said in St. Peter’s Basilica April 20. “Each of us is called tonight to rediscover in the Risen Christ the one who rolls back from our heart the heaviest of stones. So let us first ask: What is the stone that I need to remove, what is its name?” he asked. Pope Francis said the “stone of sin” blocks many hearts. “Sin is looking for life among the dead, for the meaning of life in things that pass away,” he explained. “Why not prefer Jesus, the true light, to the glitter of wealth, career, pride and pleasure? Why not tell the empty things of this world that you no longer live for them, but for the Lord of life?” Francis asked. The Vatican Easter Vigil Mass began with the blessing of the new fire in the atrium and the blessing of the paschal candle. The pope then processed into the dark church carrying the lit candle to signify the light of Christ coming to dispel the darkness. “Today, let us remember how Jesus first called us, how he overcame our darkness, our resistance, our sins, and how he touched our hearts with his word,” he said. “Let us not keep our faces bowed to the ground in fear, but raise our eyes to the risen Christ. His gaze fills us with hope, for it tells us that we are loved unfailingly, and that however much we make a mess of things, his love remains unchanged,” he said. “The Lord loves your life, even when you are afraid to look at it,” he said. “In Easter he shows you how much he loves that life: even to the point of … experiencing anguish, abandonment, death and hell, in order to emerge triumphant to tell you: ‘You are not alone; put your trust in me!’” he continued. During the Easter Vigil Mass, Pope Francis administered the Sacraments of Initiation – Baptism, Confirmation, and the Eucharist -- to eight people, from Italy, Ecuador, Peru, Albania, and Indonesia.